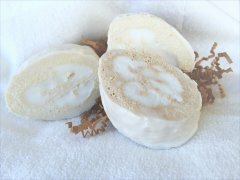 Exfoliate your feet and elbows with all natural Shea butter soap and essential oils that your skin will love. Shea butter is ultra moisturizing - anti aging and anti bacterial. It helps with itching and skin irritation due to insect bites, eczema, psoriasis, and other skin conditions. Shea butter soap is rich and creamy and will never leave your skin feeling dry. Wet the loofa bar in your shower or tub with water then rub on areas of skin that require extra exfoliation such as feet, knees, and elbows. Store your loofa in a dry place out of water when not in use. ingredients: Vegetable Glycerin, Coconut Oil, Sodium Stearate, Sodium Myristate, Palm Oil, Sunflower Oil, Sorbital, Shea Butter, Purified Water, Titanium Dioxide and essential oils.